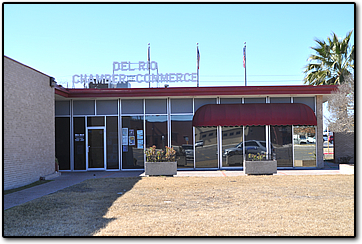 The Mission of The Del Rio Chamber of Commerce (DRCoC) is to promote and stimulate economic development, and to create and stimulate opportunities among members, corporations, government agencies by facilitating and engaging each other in cooperation to promote and build the Del Rio area. We accomplish our mission by providing and supporting economic development and opportunities though interactive communications, member services, and established partnerships. To coordinate the efforts of members, corporations, and government agencies in maintaining and strengthening a sound and healthy business climate in the Del Rio area. To sponsor aggressive programs of work and stimulate activities that will provide for full development of our economic resources. To create broad understanding and appreciation of the opportunities in the Del Rio area, and to promote advantages and assets within the area, state, and world. To promote US-Mexico trade and cooperation and contribute to economic development for the region. 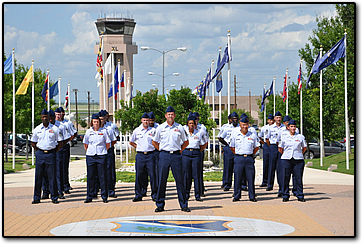 Laughlin AFB - with a total economic impact of over $183 million each year - is aided year-round by the activities of the Del Rio Military Affairs Association. They welcome new personnel, host graduating classes and their families, recognize outstanding enlisted men and NCOs, and honor incoming and outgoing commanders and other dignitaries. Tourism, generating over $1 million per year in local tax revenue, is promoted by the Convention and Visitors Bureau. CVB recruits and assists conventions, tournaments, sports and travel writers, trailer and bus tours, and sports and travel shows. In addition, CVB publishes all tourism material, places all Del Rio advertising, and answers all tourist inquiries. Industry, generating more than $30 million in salaries spent in Del Rio, is recruited and served by the the Del Rio Area Development Foundation. These trained volunteers tour prospects, provide local information, and meet with support facilities for prospective industry. The Chamber of Commerce has the only in-place and ongoing programs supporting Del Rio's three largest industries. This is accomplished by the dedication of the staff and membership. Committees are made up of business owners and their employees who volunteer their time and expertise to further the goals of the Del Rio Chamber of Commerce. AN OPPORTUNITY TO HOST A MONTHLY NETWORKING MIXER at your place of business and or partner with another business. This is a great networking tool and is held at an informal setting. BUSINESS INFORMATION DISTRIBUTION - place your business cards/brochures in the public area of the chamber office. BUSINESS PROMOTION - on our FB Page as well as on our E-mail blasts that are sent every Wednesday & Friday to over 1200 recipients! BREAKFAST EXCHANGE – 3rd Wednesday of every month –8am-9am & held at a different business each month. This is an informal venue to meet business members. Be ready for breakfast and to give everyone your 60-second elevator pitch! MONTHLY MEMBER MIXERS – 4th Thursday of every month – hosted at a different venue every month. Take advantage of the opportunity to promote your business and network.